In all honesty I was never a fan of oatmeal. It’s a texture thing. But they are supposed to be good for you so I tried them again as an adult, and again, it was a texture thing so I started incorporating oatmeal into my diet in other ways – granola, cookies, toppings for crisps and crumbles – but those are not the healthiest options. WAIT! WHAT? I am a total convert! When you cook steel cut oats in cider or apple juice something magical happens and now I love oatmeal in the morning. The oats don’t get that slimy texture that I find off putting, and they are chewy and toothsome when cooked in the cider. It’s almost like eating hot granola because of the flavors and textures. 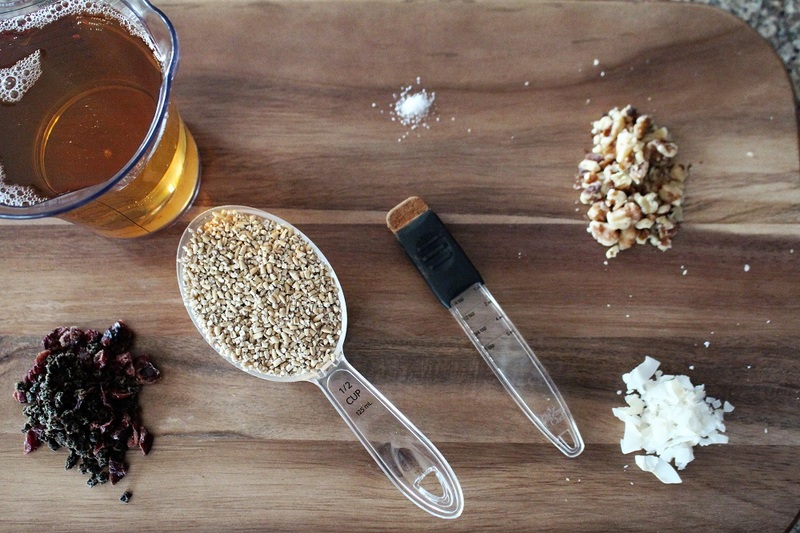 I have not tried this technique with rolled oats, but if you do, let me know how it comes out. Try this the next time you are in the mood for something sweet-ish that will stick to your ribs and you can feel healthy about at the same time. 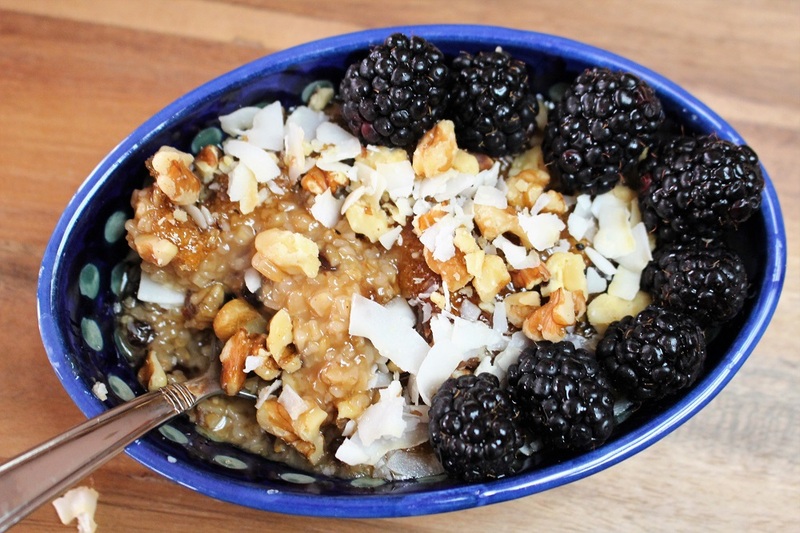 Steel cut oats are often found in the bulk department of some groceries, so you don’t have to buy an expensive container of oats to find out whether you like this recipe or not, just buy a little bit. Additional Bonus – you can customize it anyway you want. See notes at the bottom. In a small non-stick saucepan, combine cider and fruit. Bring to a simmer over medium low heat. This allows the fruit to rehydrate and get plump again. Stir in oats, salt and spices. Reduce heat to low and cook, stirring frequently until the liquid is absorbed and the oats are tender to YOUR liking (see notes). Divide between 2 dishes and top with the nuts and coconut. Enjoy! Stir frequently! The natural sugars in cider make it stickier than the water usually used, and as you cook, the cider will become syrupy. And DO use the non-stick pan rather than stainless. Clean up will be easier and the oats won’t stick to the pan as easily. You can add literally ANY dried fruit you like. I choose the small fruits because I like the texture after they have been cooked in the cider. Try dried cherries, blueberries, or different varieties of raisins. If you are going to use dried apricots or something else that is already plump or large, cut them up and stir them in at the end. If you like your oats really soft as opposed to al dente, or if you like your oats soupier, you may need to add more liquid. You can add water instead of more juice. Taste test for doneness and add liquid as necessary no more than a ¼ cup at a time. If you want a higher fruit to oat ratio, increase your liquid because the dried fruit will absorb some of the juice and you’ll end up with undercooked oats. 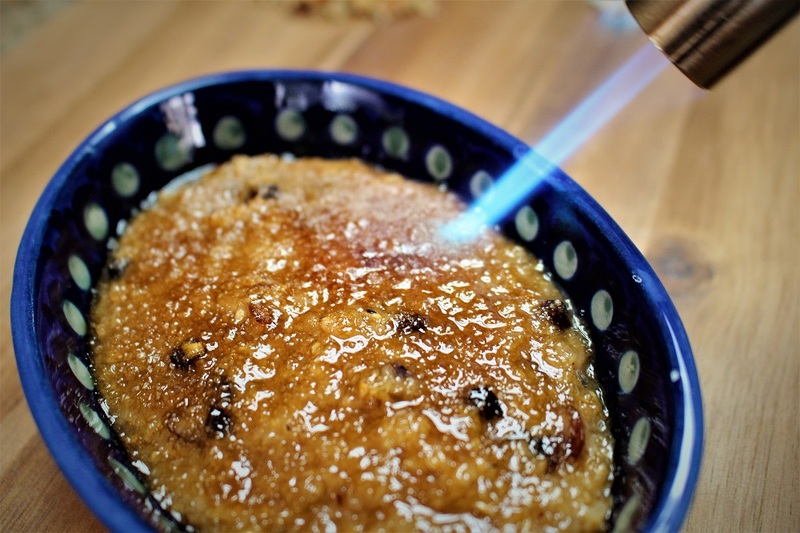 If you want to get fancy, before adding your toppings, sprinkle with demerara sugar and blast it with a torch (like in the photo above) caramelizing the sugar to brûlée the top. Allow to cool until the melted sugar is crunchy, about 15 seconds, and then add the toppings. It can be made ahead and refrigerated overnight, and zapped in the microwave, but the texture is best the day you cook it. It will thicken up over night.